About four years ago Microchip debuted in the ethernet controller market with the introduction of the smallest standalone ethernet controller, the ENC28J60. 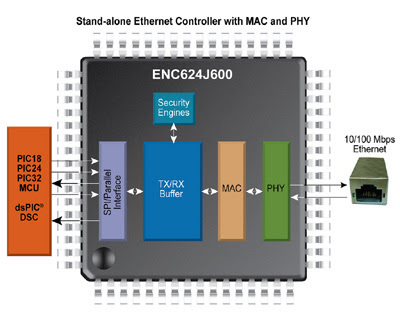 While embedded application developers looking to add a networking interface to their designs had other options, the ENC28J60 became a very interesting alternative for many applications since it didn't require to use many I/O pins from the MCU to talk with the controller. Just a few components, the RJ45 with integrated or external magnetics, a simple connection using the SPI interface and voila you were on the 'net courtesy of the free Microchip TCP/IP Stack. 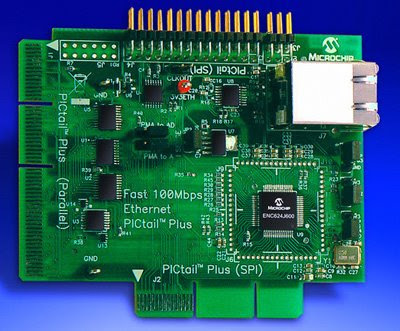 Few months ago we started savoring and playing with samples of a new generation of ethernet controllers to be available from Microchip, the ENC424J600 and ENC624J600. Today, Microchip made the official announcement !! How many times folks asked in the Microchip forum where to get the MAC address from ? Now it's on the chip ! !, no more hassle you get the chip you have the address !! If you can't control your anxiety to put your fingers on this new part and start playing with it, more good news, the 10/100Mbps Ethernet PICtail is available for purchase from Microchip. In the past few weeks I've been working on a new network interface card similar to the nic28 I produced in the past for the ENC28J60. Just waiting for the first batch of pcbs to arrive and complete testing and documentation. I'll soon post some pictures and specs for the new nic424 that will become available for purchase through LJCV Electronics.